Well, I don’t know if it was just low expectations following last week’s flattish effort (and previous two-parters stinking the place up), but I ended up rather enjoying that. Not sure it all quite hung together, but there were a lot of very pleasing bits - not least the fact the Sontarans are rather interesting all of a sudden, aren’t they? Sontarans aside, there was a lot for oldies and newbies to go ‘squeeeee’ over, here, not least Martha’s return (and what 12-year-old boys will forever refer too as the, ahem, ‘cloning scene’). UNIT! With Greyhound call signals! A teleport! Bernard Cribbins! UNIT!! All right, they’re not quite the 1970s’ UNIT (or was it the ’80s? ), but having them around is just good, and raises loads of interesting questions about the Doctor: just what was our freewheeling wanderer in space and time doing, chucking his lot in with the Establishment? He doesn’t do salutes, or orders, or guns… except in the latter case, especially, he does. And has. This season is showing how Tennant’s magnetic Doctor is as likely to repel as attract. Is it that he ‘doesn’t do’ families (units? )… or that he can’t? Why remind soldiers prepared to salute him (and even blimmin’ Donna!) he’s a genius? They know: they’ve got the files. Why bully the (admittedly really-slappable) teen genius, who he clearly empathises with? Can’t he get a reaction any other way? ‘A face-changer’, Staal calls him, and that’s close. The Doctor himself is an actor on a stage, entering, exiting, trying stuff on to get what he wants, and messing it up, a lot, where humans are involved. He doesn’t ‘get’ that Donna is just popping home: he’s ready with a stagy leaving speech. Donna and Grandad know each other; who does the Doctor know like that? And Donna and Martha bond quickly - so secure in each other that Martha gives the new companion what she needs most: a warning. Anyway, next time: The Sonatarans are buying, what’s your poison? A CASUAL glance at my contract reminds me that, as part of my role as Evening Post Scientific Adviser/ Mysterious Projection From The Future With Special Responsibility For Alerting Mankind to Impending Doom (hey, it pays the rent), I’m meant to give you a heads-up about the Sontarans, who begin their two-part invasion of the airwaves on Saturday, weather permitting. Allow me to apologise, then, because they’re already here, built for war and deeply embedded in the listings magazines and telly previews. You can hardly have missed their piggy little eyes staring out at the newsstand, and the fact that Sontarans are nasty, brutish and short… and look very like baked potatoes. Look, I’m only saying it before some other scoundrel does - don’t imagine the chip-loving Doctor will let the resemblance lie. 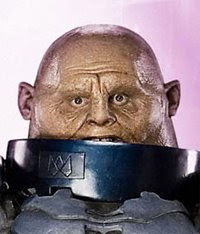 In fact, the Sontarans pretty much define ‘chippy’. Locked in an aeons-long war with the Rutans (who for their part look like manky cabbages; think of the money you’re gonna save on action figures, Whokids), all they’re interested in is a) battle and b) victory, and not necessarily in that order, either. A bunch of slightly-Cockney Sontarans (imagine the Mitchell bruvvers in dwarf star-alloy survival suits) even had the neck - well, not neck… even had the cheek to invade Gallifrey back in 1978, with a view to conquering all of space and time, forever, in one go. 3) They’re clones, but did once have a primary and secondary reproductive systems. Too much info? 4) Even these relentless warriors need to ‘recharge their life source’ now and again when operating outside their regular environment. Aw, diddums, etc, etc; try telling your own boss that, next time you throw a sickie! 7) In the Sontaran Experiment (1975) they assessed a post-apocalypse Earth’s suitability for invasion by carrying out cruel tests on surviving humans; one poor sap had to eat 50 eggs in an hour. Sick. 10) Beans and cheese £1.50, tuna/mayo and coleslaw 10p extra. *Advice not legally binding in event of actual Sontaran invasion. A slip in the snow? The Sensorites: a harmless little first Doctor potboiler from 1964 set on the Sense-Sphere (a planet rich in Molybdenum as I remember it, if you’re thinking of going). It’s wholly appropriate it got a namecheck here, because Planet of the Ood is just such a harmless little potboiler. Okay, it’s not Blink, but it’s not Dragonfire either - it’s one of the many Who adventures that make you think nothing much more than ‘Nnnyeah…’, while still entertaining every right-thinking person in the house and raining fire on whatever the commercial stations have reheated to insult the brain. Talking of which… was it, in parts, a mite over-icky for a teatime slot? The schedulers have been meddling unnecessarily, anyway, but should the villain be sneezing his grey matter up and exposing his tentacles when there’s still daylight creeping over the top of the front room curtains? You can’t help thinking the rabid Ood was a bit too 28 Days Later for a six-year-old, say. Not that the Watcher secretly serves the Church of Mary Whitehouse or anything; raised on fishfinger sandwiches and the Brain of Morbius, we think it’s wholly brilliant that there’s literally a great, pink, throbbing brain at the centre of things, and that if pushed, it will absorb you, secret-goodie or not. And the Klineman Halpen reveal at the end was priceless, as was Tim McImpossibletotype’s performance - just the kind of well-judged casting and playing that can inflect a so-so story with colour and dimension. He sloughed the old scalp off like a banana skin. Heads, er, hats off to Graeme Harper too, a director who just gets Doctor Who. The grappling hook chase was briskly done, as was the sales pitch intercut with the Ood hunt - beats, angles, cuts: that’s how you tell a story. But there was unevenness here: the body-horror seemed a tad overdone, yet the moral conclusions wouldn’t have satisfied an MI:High viewer. Slavery bad, service industry soul-destroying, capitalists grasping and uncaring. Er, we know! The real shocks were Donna’s upset at the crushing unfairness of the Universe (was she expecting something else? Is she losing faith after three episodes proper?) and the Doctor admitting it’s sometimes better not to know what’s right and wrong. Eh?! He can be a cold, dark one, sometimes, this Tenth. Some of you thought Tennant was a bit too shouty last week (maybe…), but he’s every inch the Doctor now, is he not? Time served in potboilers is part of the job description, and he’s an all-time top-three Doc, we’re saying. Anyway, next time: cover your probic vents, they’re sending in the clones - it’s the return of the Sontarans. I’ve just checked in The Shadow Proclamation, and I’m allowed to say this: the Fires of Pompeii rocked (‘Stone me!’ is the banned one). Having gone to all the trouble of going to Rome’s Cinecitta for filming (even timing their arrival to coincide with an unexpected disaster in the shape of a fire, aptly enough), you sort of assumed the production crew would make it all look brilliant, but hang on; let’s not speed past that last thought - it all looked absolutely brilliant. “Sumptuous,” according to the Watcher’s assistant, and she’s not wrong. From the dappled dust and sunlight of the opening scenes to the TARDIS/Vesuvius/The Ordinary Family Lives! tableau at the close, this was perhaps the best-looking bit of Who ever served up (but over to you). Ordinary folks anchor so much of the new series, of course, and the bit-too-soapy comings and goings of Caecilius and clan early on made one cry out for a 24-megaton firecracker, the sooner the better (I always felt the same when the TARDIS landed on the Powell estate, mind). And yet… James Moran’s RTD-guided script did actually make one care, and gave a human dimension to the historical pyrotechnics. Okay, Peter Capaldi, and baddie Phil Davis (and That Woman Out Of Howard’s Way) didn’t have that much to do, but what they did do was fine, and the fact they’re there speaks volumes for the new show’s pulling power. Nice nods to the old show, too: coin behind the ear? Hello, third Doctor! Incongruous police box as modern art? Hello, City of Death! Loopy-looking seers hoofing round a flame? You’re not the Sisterhood of Karn in disguise, are you? No, you’re the Sibylline Sisterhood, and you’re right to say there’s something on Donna’s back: flippin’ critics. So many seemed ready to hate Tate from the get-go, but this episode really underlines Donna’s qualities: heart, guts, and conscience, all brilliantly evoked by the actress. She really gets the Doctor - “You fought them off with a water-pistol! I bloomin’ love you! - and he needs her; he admitted it! Good to see in the coda that the citizens of the Rome AD 80 quite rightly worship the Doctor, too, even fitting a widescreen altarpiece - but how disappointing that the feckless son looks set to become an Aston Villa fan, judging by the colour of his toga. Some kind of Roman/Villa gag, is it, in a show packed with better ones? Because it wasn’t always like that. There were no ‘watercooler moments’ in – I pluck a date from the ether – 1987, for example (the year Pete Tyler died, right kids? ); ask a colleague back then what they thought of Delta and the Bannermen last night and they’d reply: “I think you ought to kill yourself.” Nowadays men, women - adults - wax about the way David Tennant puts his glasses on. But be assured, when it came to seventh Doctor’s spoons, it was no dice, conversation-wise. No, there weren’t watercooler moments. There were snatched - I hesitate to say furtive, but furtive - moments, mainly grabbed in playgrounds, libraries and canteen queues, brief sequences where fellow-travellers might share a muttered ‘joke’ about reversing the polarity of a broken tea urn, or some such. We saw, and understood in each other, the flatness after the fourth Doctor went; shared the same symptoms through the sixth Doctor era (headaches, mainly); were unsteadied by the mad gleaming joy of getting the novelisation of The Five Doctors before the show itself had even been on the blimmin’ telly! I still get a weird feeling in the, er, tummy about that – the tingle of a bottled-up feeling with nowhere else to go (see also: Elisabeth Sladen). It was torture on the old love life, actually, especially in The Teen Years. Three moments grabbed from the vortex (humour me): a too-involved discussion of thermodynamics on a bus that ultimately ‘forced’ a feeling-left-out girlfriend into the arms of a trumpeter; a rather-too-casually-left-about copy of Revenge of the Cybermen scuppering a lunchtime tryst; and a horrible, cringe-making scene that went: ‘MustyoureadDoctorWhoMagazinewhenyou’resupposedtobewatchingmeplaytennisGodyou’resoembarrassingIhateyou (In fact, girls turned out be vastly overrated, anyway; but still). No, I don’t know from where this Who love sprang; first memories, unlocked by expensive medical experts, show a confused picture of the third Doctor fleeing giant bats in a haunted house and falling headlong down a creaking staircase, landing, heroic but broken, only to regenerate into… Captain Kirk. Needless to say that never happened, not on Sol 3 telly anyway, and is not, in fans’ parlance, canonical; but it’s etched in the old tablets nonetheless. I think it all started there… but then, I don’t remember the moment I ‘picked’ my football team, either, and regard those that do with a deep suspicion. Sometimes stuff – the good stuff – finds you. And it’s a lifelong affair from then. Over the years, we Doctor Who fans have seen it all: some amazing Saturday afternoons, especially in the seventies, with famous victories and bitter defeats; brilliant signings; strange managerial decision, and appalling tactical gaffes (Tegan, Adric and Nyssa?! ); flat midweek action; misguided foreign interference; relegation and - ulp - administration… Exterminated. Us, of all people. Still, I’m not bitter - far from it. There’s new money in the club - the, er, show - now, and everybody’s a fan. Good. Very, very occasionally you might find me browsing for... well, let’s say special interest DVDs (all right: Doctor Who DVDs), and some young scamp will push past and tell his mum how this DVD is the one with the old Doctor - that’s Christopher Eccleston - and the Slitheen from ages and ages ago, but could he have £13.99 to complete his collection anyway? No, the important things is the adventure is still unfolding; next Saturday night, and the Saturday after, and after that, and after that, forward, backwards, sidewards, courtesy of the old timey-wimey stuff. Anything and everything could happen.